It is National Cheeseburger Day, celebrate with these juicy deals! No cheesy jokes here. Just a gouda roundup of deals for National Cheeseburger Day, Sept. 18. So, if you're looking for lunch, here are a few business promotions around town hoping to take advantage of the festive (and delicious) fun. You need to mention the promotion at each venue to get the discount. Arcadia Tavern: Score a double cheeseburger and a beer or soda for $10 from Sept. 15-18. 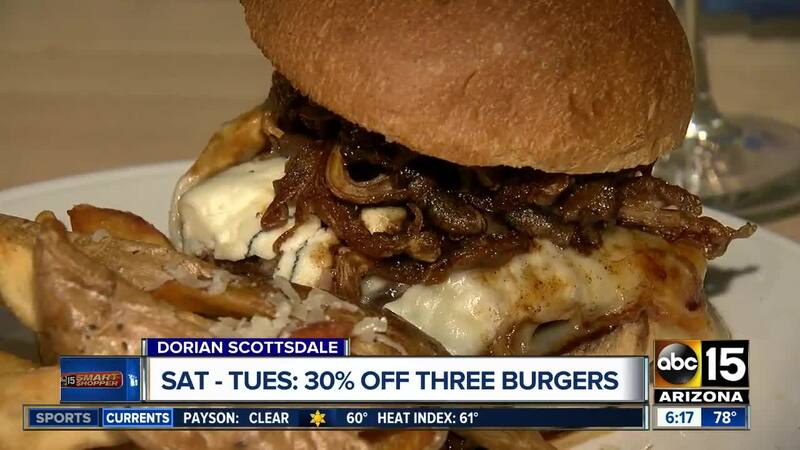 Dorian: The Scottsdale restaurant is offering 30% off three of its burgers from Sept. 15-18. They are regularly priced at $16 each. With the discount, you can probably expect to save $4. BurgerFi: The burger chain will be offering a buy-one-get-one-for-$1 promotion on National Cheeseburger Day, Sept. 18. Those who purchase a BurgerFi Cheeseburger will get a second one for $1. 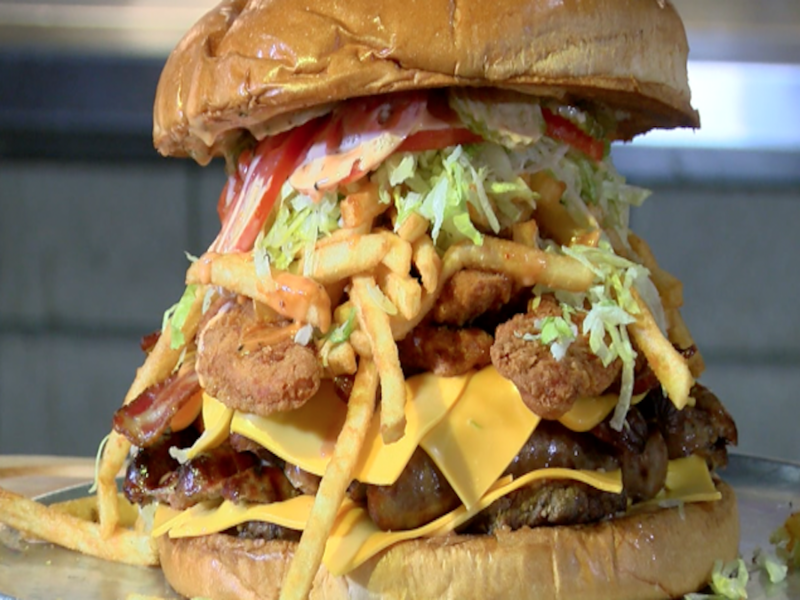 The burger has two burger patties, double American cheese, lettuce, tomato and sauce. Burger Theory: The burger chain is offering 10,000 free Classic cheeseburgers on Tues., Sept. 18 at all locations throughout the United States. The location here is at the Holiday Inn & Suites Phoenix Airport North. For more information, click here . Pomelo at The Orchard: Diners can get 10% off all burgers on Tues., Sept. 18. 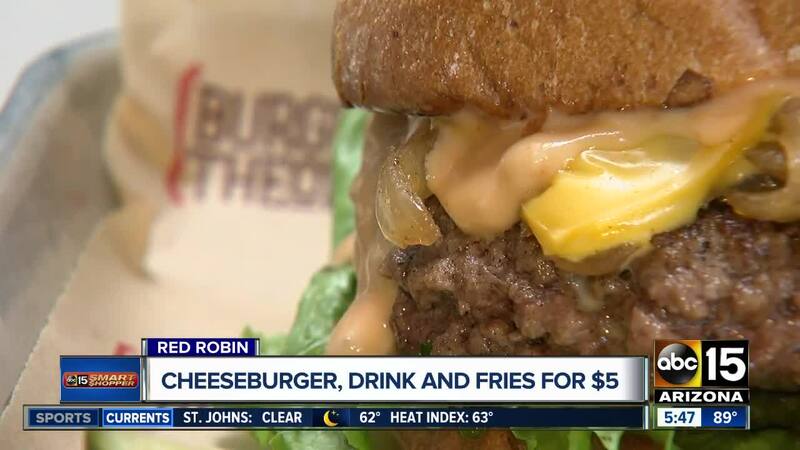 Red Robin: The national burger chain is offering guests a gourmet cheeseburger and bottomless fries for $5. You have to purchase a drink in order to get the deal. To give perspective, the normal price of just the cheeseburger would be $9.99. It's like you're getting it for half off! TEXAZ Grill: The Phoenix restaurant will be grilling specialty burgers for $8 on Sept. 18. Black Angus Steakhouse: On National Cheeseburger Day, Black Angus will have two specialty burgers: its Steakhouse Bacon Cheeseburger and Guacamole burger. Both will be served with fries or coleslaw, and a 16-ounce draft beer. The cost: $10.99. Modern Round: Buy one, get one FREE: The Big Shot Burger, Grilled 10oz. Arizona Grown Angus Beef + Smoked Gouda + Arugula + Tomato + Caramelized Onions + Applewood Smoked Bacon on a Garlic Toasted Brioche Bun. In case you missed it, Wendy's is running a free burger promotion throughout the month of September.